3. In process of cooling engine compartments with separate closed loop system producing additional electricity on the ground surface." The "Self Contained In-Ground Geothermal Generator" (SCI-GGG) system consists of several main compartments: a boiler compartment; a turbines compartment; a generator compartment; a condenser distributor compartment; and a condenser compartment that are arranged so to function in limited space such as a well bore. 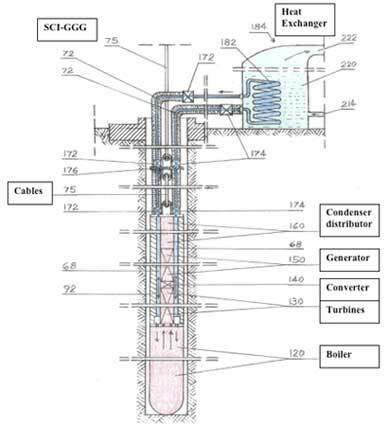 The boiler is exposed to the heat of hot rocks while rest of the apparatus is thermally insulated from the heat and is additionally cooled with second closed loop system. The second closed loop system is engaged with third closed loop system on the surface, which is Binary Power Unit, and can function separately as an independent apparatus – explained further as the "Self Contained In-Ground Heat Exchanger" (SCI-GHE) system. If necessary, the Organic Rankine Cycle (ORC) is applicable here. The condenser compartment is formed between two cylindrical walls which surround turbines, generator and condenser distributor compartment and is cooled by circulating water through the condenser with second closed loop system. Heated water is brought up on the ground surface to a heat exchanger which is engaged with third closed loop system which is Binary Power Unit. By lowering SCI-GGG apparatus in predrilled well bore to the hot rocks, or hydrothermal reservoir, electricity is generated below the ground and transported up to the surface by electric cable and subsequently through electric grid to the houses and industry. One power plant consists of a few dozen well bores with SCI-GGG apparatuses; a cooling system exchanging heat on the ground surface using multi-phase cooling system and binary production units which also produces additional electricity; and a control center. Production capacity of the power plants depends on the number of the well bores, and diameter and the length of the apparatus, and of course, temperature of the hot rocks. Deeper we drill the higher temperature of the rock formation we can reach. The (SCI-GGG) system uses several completely closed loop system and eliminates the issues of injection water, concentration of brine, filtration, separation, equipment corrosion, scaling, and ground water pollution, etc., and at no time is there any contact with the environment by the working fluid or the heat exchange fluid therefore it doesn’t pollutes environment. 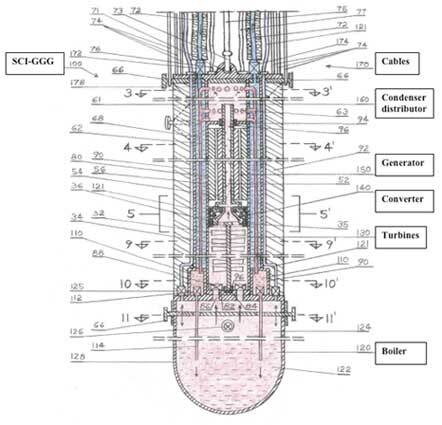 Although main purpose of the (SCI-GGG) system is to use limitless dry hot rocks for production of electricity, the (SCI-GGG) system is not limited to dry hot rocks - it can be lowered into existing hydrothermal reservoir or can be suspended with cable over lava flow (lava tube) in locations such as Hawaii. NOTE: Although drilling expenses are substantial at this time, it is worth to drill even with conventional drilling technology because once we reach hot rocks we will have access for energy supply for centuries. We also have developed a new technology for drilling deeper and wider well bores which eliminates limitations, well known in contemporary drilling technologies, relevant to depth and diameter which will drastically reduce drilling cost.